Two-time World Junior Champion Akane Yamaguchi is the only current top ten badminton player who missed the recent BWF World Championships. Just as the women’s singles seeds were starting to make their initial appearances on court in Jakarta last week, Yamaguchi was winning her third consecutive national high school girls’ singles title in Kyoto. Akane Yamaguchi (pictured) beat the top seed before losing in the quarter-finals of the recent Indonesia Open in Jakarta but she elected not to try her hand at the Worlds. Yamaguchi, who two years ago became the youngest winner in the history of the Superseries, was younger last Sunday than any previous World Champion but she was busy taking care of junior business. In another national event earlier in the year, the 18-year-old had lost to Moe Araki, who later also went on to win bronze at the Asian Junior Championships in July. 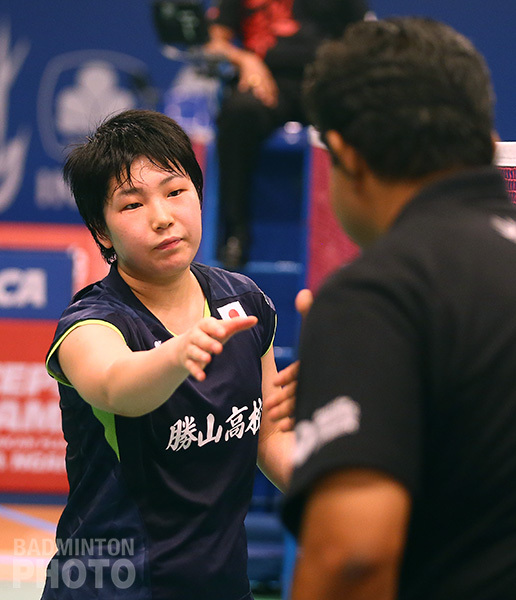 Yamaguchi beat Araki in the semi-finals in Kyoto, then Shiori Saito in the final. Playing for her hometown high school Katsuyama, Akane and partner Saki Suzuki also finished second in the girls’ doubles, beaten in the final by German Junior Open winner Chiharu Shida and her partner Natsumi Oda. In terms of international events, Yamaguchi will next be in action at the Japan Open next month. This year, she has the chance to equal Ratchanok Inanon’s record of three straight World Junior singles titles but to do that, she would have to skip the China Open Superseries Premier, potentially sacrificing points that might help her to qualify for the Rio Olympics.